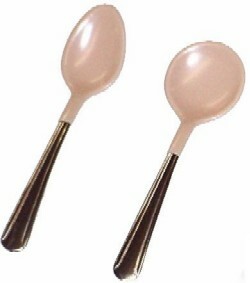 The Plastisol coating on this collection of lightweight spoons is placed on the spoons for the express reason of protecting the teeth, gums and lips. 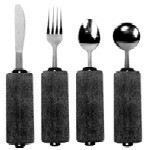 Some individuals with problematic hand mobility may have difficulty in getting eating utensils to their mouths smoothly without a stabbing or jerky motion or biting down on the utensil when not appropriate. That stabbing/biting motion may cause injury to the teeth, lips and gums. The Plastisol Spoons will reduce the injuries related to these situations. 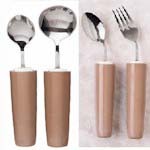 The Plastisol spoons come in two sizes; a teaspoon or a soup spoon. 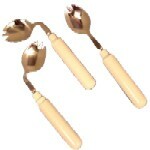 The spoon handles are made of stainless steel and the spoon bowls coated in non-toxic Plastisol. The soup spoon is 6 inches long with a round 1.5 inch bowl. The teaspoon is 6 inches long with a 1.25 inch bowl. Daily inspection of the utensils is recommended for damaged coating. They are not recommended for heavy biters. The spoons are dishwasher safe but cold sanitation is recommended. Packaged as a set: one teaspoon and one soup spoon. Please shop carefully, this products is not returnable.